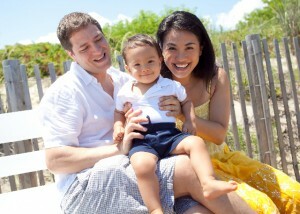 Mike, Max (12 months) and Angela Hollick in Rehoboth Beach, DE. We are going on a tour across the country. Won’t you join us? “Cool! Road trip!” you say. To that, we laugh. This is no whirlwind stint; we are not stopping at rest stops, cheesing it up at touristy landmarks or shacking up at motor lodges, knowing that we’ll eventually make our way back home. For us, the road = home. Traveling from city to city will be our life as we know it. Starting in 2012, we’re leaving our cute little yellow house in a comfy Las Vegas suburb, throwing most of our belongings in storage, sending our cat Turkey up to my best friend in Portland, and jumping on the National Tour of The Lion King musical. It’ll be both exciting and daunting. On average, we will move every 4 weeks — just enough time to perhaps feel settled in before we hit the road to the next city. Here’s our goal: to share with you our best road-tripping tips for families with young children, like how to find great “feels-like-home” lodging for reasonable prices, best restaurants to eat at (with or without kiddos!) that won’t break the bank, and the coolest kid-friendly things to see. We’ll always be on the lookout for cost-cutting ways to live without sacrificing quality of life. And I have a feeling our perception of “quality of life” will transform during the course this adventure! What’s more, we can take you behind-the-scenes in the real life of a show business family, traveling with one of the biggest Broadway shows. What is the cast like? How fun or scary is it to figure out a new city every month? How do you keep from feeling lonely? Where do you live? What are the best ways to meet locals? Is this kind of life as exciting as it sounds? How are you going to do it with a baby? Um, we can’t wait to find out too. 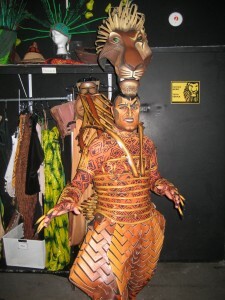 Mike backstage in full Scar costume, before a rehearsal of The Lion King in Las Vegas. What do you do with The Lion King? Mike understudies two principal roles in the show: Scar, the evil lion; and Pumbaa, the farting warthog. If you’ve seen the movie or show, both roles are vastly different. Let’s just say that Mike has quite the range. How will life on the road ever top living in Vegas? We are actually New Yorkers. That is where we met, in 2003. We married in 2007 and have bounced around between Brooklyn, Los Angeles, and Sacramento. The Las Vegas production of The Lion King hired Mike in March 2010, when Angela was four months pregnant with Max; and thus they made the move to the desert. Although we found Vegas to be slower-paced than New York City, Max was actually born in typical dramatic Hollick style — you can read the newspaper story of his birth here! What cities will The Lion King be in? Mike will join the tour in Minneapolis in January 2012, after the Vegas show closes on December 30, 2011. Now, we’ve only heard about the bitterly cold temps that part of the country reaches during winter. Ang called a hotel front desk in Minneapolis recently, asking about how far the walk was to the theater. The clerk snickered, “You don’t walk outside here in January. Especially if you’re…not from here.” Interesting. You know the part in the wedding vows, “For better or worse”? Ang thinks there might be a clause in there about frigid weather. Therefore, she and Max will hang with her family in Northern California and then join him on the following leg in Richmond, VA. (Don’t worry, Mike will still be blogging as the solo traveler then!) After that, the entire family will hit New Orleans, Orlando, Miami, Greenville, SC and Houston — just to name a few! You can see the full tour schedule here. Let me know before you swing through NOLA! I’ve got two close friends living there who have a little girl just a few months older than Max. They could be a great intro to the city for you guys. (And of course, I’ve also got some great food recommendations. Two words: praline bacon). Haha – praline bacon, says the former vegetarian 🙂 I love it! Yes, we’d love to connect with your friends. It’ll be a saving grace for us, as we try to figure out socialization and childcare/community in this “next life”. Thanks Erika! Miss you! Wow! The website is awesome!! Thanks Jan! We may ask you to write a “guest post” from the perspective of a mom who travels for work, and the effect on you and your family. Such an interesting and relevant topic for modern families! We miss you and Max will just love his Christmas gift from Grandy 🙂 Thanks again! When’s the tour come through Jerusalem? Darrell, wouldn’t that be a trip indeed! We’d at least know we would have Fridays/Saturday off 😉 I’m glad you are subscribing and following us on this adventure — and I do want to hear about yours too! Perhaps a guest post?? Love to you and Leah! I want to know how Mike is gonna catch all the Steeler games!!! You are the consummate traveler, Brian! Don’t you catch the games in China? I need your advice more than anything! I may have to try watching online somehow too. Have you tried that? I see the international cities as well….are you going international also?? So fun! Hi Leah! We’re staying on the North American tour – the international cities have their own casts. But we may not necessarily stay on the “mainland” US 😉 We’re crossing our fingers for some exotic American locales! I can’t wait to follow this journey. What an exciting adventure! Miss you Kira! Yeah, we’re pretty psyched! It should be fun and challenging. Hope you’re feeling better and getting back into the show soon. Love to the Fuerzabruta family from me! You’re right about the midwestern winter. I’m from Wisconsin. Let’s just say, people do a lot of driving in the winter time. Congratulations, Mike. Maduka, I didn’t know you were from Wisconsin! Are you a Packers fan? Thanks for dropping us a line! I love hearing from Carnegie Mellon comrades. What are you up to now? Your website is fabulous and from one entrepreneur to another, much luck, love, and courage as you chase your dreams. Your old Delaware friends will be rooting for you and hoping for a date in Philly! 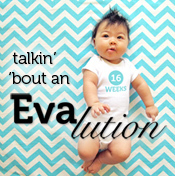 Annie, we’d love to hear about your entrepreneur adventures! Thanks so much for the kind words. I miss Delaware and Philly — hoping to get back sometime soon. Have a happy New Year!